Centella Asiatica, Pennywort, Gotu Kola Centella Asiatica is used to treat stop cancer cells, skin disorders, arthritis, migraine, confuse, fatigue and hemorrhoids. Centella contains a group of triterpenes called asiaticosides that possess strong antioxidant properties. In modern health care, Centella is used primarily for venous insufficiency, localized inflammation, and infection, and post-surgery recovery. 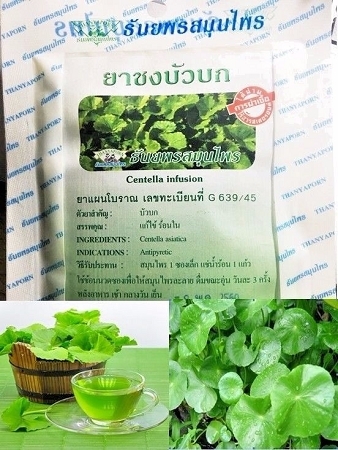 Centella is also used for the following: Skin: Open wounds, sores, ulcers, other infections and radiation ulcers. Confinement: Bedsores, phlebitis, tingling, night cramps. Vein Problems: Phlebitis, varicose veins, cellulite, and edema. A: The teabags weigh 1500 mg each. There are 20 teabags in 1 resealable packing, this item is 2 packing with a total or 40 teabags.